Home > Uncategorized	> Thanksgiving House!? I have been a member of Professional Women Photographers here in NY for a long time. A call went out for entries for a juried exhibit called Americana. Before I started this blog, I didn’t do much random shooting. In fact, the point of this blog, read by about 3 people who are mostly family members, is to motivate me to shoot more regularly. I do, however, photograph progress on landscaping and construction projects at a subsidized housing project for senior citizens two or three times a year. The seniors decorate their windows and doors with all sorts of marvelous odds and ends to celebrate various holidays and I can never resist photographing some of the most elaborate. So I entered a few quirky images of Memorial Day decorations. What did the committee choose??? A random shot of a house next to the project!! The Americana exhibit opens on Saturday, April 17th 6-9pm and runs through May 22nd. It takes place at MH Art & Framing Gallery, 9 West 20th Street. Should be fun. First off, thank you for participating in the “Americana” show, your work balances the others nicely. Secondly, it seems more than three people are reading your blog! To extensively explain why this piece went into the show, as opposed to what you would’ve expected to be accepted from your submissions, would also require you to view the hundreds of submissions that were sent to PWP. It was a difficult decision to choose what was to be exhibited from those submissions. I understand the perplexed feelings when you discover a specific image was chosen over another; I’m an artist as well. However, it is the ‘show as a whole’ that a curator envisions and an image may be included to further articulate the purpose of the given theme. 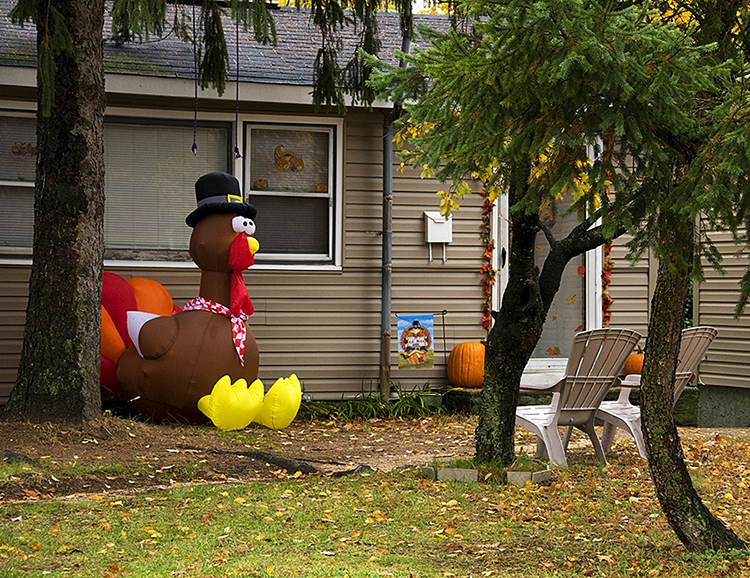 What appealed to me about your “random” shot was the peculiar decor in front of this house. There was enough imagery in the show that was seriously patriotic and this photograph contrasted that sensibility. I mean, look at that turkey! Inflatable holiday decorations are just plain odd for me. It’s also a VERY REAL documentation of American suburban life. This image addressed the theme of “Americana” uniquely and set you apart from the other photographers. I hope this abridged explanation satisfies your query. Again, it was a pleasure to have you participate in the exhibit!